The team who design, build and create adventurous places for others also live their own adventures too. On the whole we’re quite an adventurous bunch, so over the next few weeks and months, we’re going to be featuring some of the team’s adventures. First up is Freddie Egan, our Play Space Cadet. He’s building a tiny house from the ground up (or rather the trailer up!) and I interviewed him about his project. So, tell me a little about the project. “We’re building a tiny house on a towable trailer with the intention of taking it to Sweden, where my partner and I have lived for a few years, and making it our home. Tell me about the overall size. Is there an official spec for a tiny house and is it designed to meet a specific regulation? 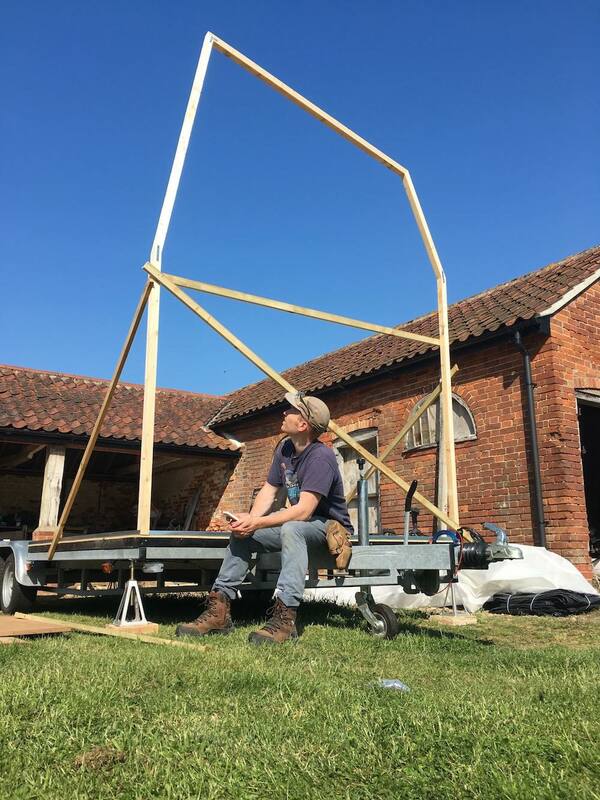 “It’s 6.5m x 2.4m with a maximum height of 4m. 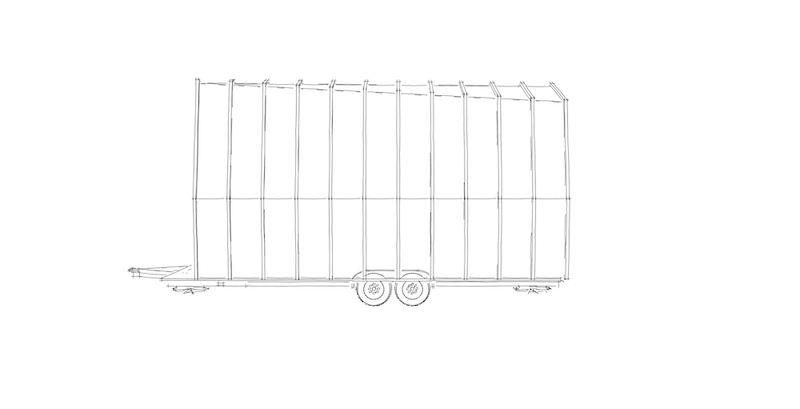 We’re building to be well within the maximum size (7mx2.5mx4m) for a towable trailer without requiring an HGV license. The limiting factor is actually the weight which is to a max of 3500kg. 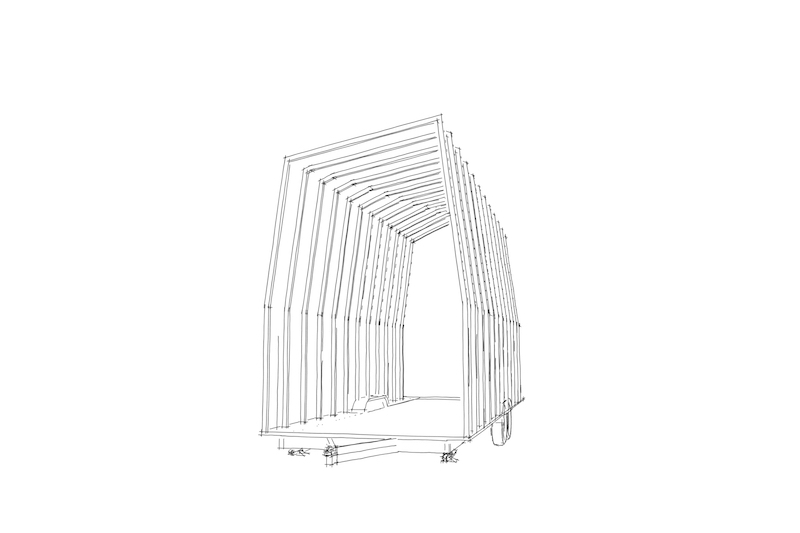 Not a simple task for a timber frame building, when the trailer itself weighs 600kg. What will you need to tow it? Is the plan to live in it or just travel and tour in it? What materials have you used in the build and where did you source them? “Weight has been a big factor in terms of choice of materials, it was all about the balance of practicality and quality. We found a great supplier in Yorkshire, who supply a lightweight poplar plywood which is about two thirds the weight of a standard sheet. We are using that to finish the whole of the inside and build the cabinets and a lot of the furniture. The outside is being clad with a lightweight, hardwearing timber. It’s called Thermowood and is a softwood that has been specially heat treated to reduce the moisture content and is a product that CAP.Co are beginning to use more and more. What sort of maintenance will it require and have you planned this from the outset? “We’ve designed the house to be quite efficient and it should need minimal maintenance. For instance, our choice of cladding was considered with this in mind; instead of going for shingles which may not travel well, we went for a lightweight agricultural corrugate on the roof – tough and flexible, but easy to replace – and the Thermowood I mentioned, as it’s resistant to damp and spores, and is really lightweight. We tried to plan and design with a perspective on sustainability, while still being realistic about how we want to live in our tiny house. This included being aware of the amount of water and energy we’ll consume, and the waste systems we need. For example, we’ve got a composting loo which separates waste and creates compost – all you need to do is add a little bit of natural fibre! So the whole system is totally waterless, odourless and hygienic. It only needs emptying every couple of months. It’s the way forward. There’s a 150l water tank on board which will need refilling every 7-10 days or so and that supplies all the sinks and shower. What inspired you to do this project? Was it your time living in Sweden or something else you’ve seen on your travels? What’s been the biggest lesson from the project to date? When do you plan to complete it? Have you got any plans for your first outings?